Recently I put together a promotion application. For those of you unfamiliar with the Australian system, this is similar to a tenure application in the U.S.A. You must compile everything you have done in your academic career, assess its impact and present it all as a legible ‘story’ of your contribution to your discipline and your university. Colleagues warned me that doing a good promotion application is a lot of work and they were so right. The best advice I got was to treat it like putting together a journal article. Gathering evidence of your achievements and impact involves hours of combing databases to find convincing statistics, asking colleagues to write testimonials and reading back over your diary to remember what you did and when. This turned out to be an intense month as I only had time to do it at night. 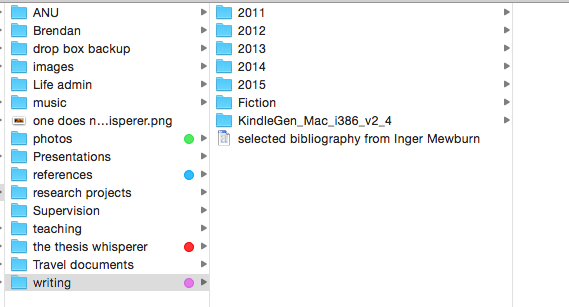 I had just finished writing the MOOC and the Inger Writing Tank was almost at empty. I had to use my full range of emotional coping strategies – whingeing to Mr Thesis Whisperer (and anyone else who would stand still long enough to listen), chocolate, James Blunt records and so on. Slowly, painfully, I managed to compile and write the narrative of my academic self. It was a good thing to do even if the promotion application is unsuccessful. My academic CV now is a complete record of everything I have done and I was reminded just how many friends I have in this industry. Colleagues offered advice, sympathy and testimonials that brought tears to my eyes. Special shout out to Susan Mayson, Sandra West and Megan McPherson who read drafts and to the steadfast Mr Thesis Whisperer, who did a painstaking copy edit at 11pm at night, right on the deadline. I am grateful for my #circleofniceness. But I’m not here to talk about promotions process (that’s a story for another time), I want to tell you what I learned about organising all the stuff we researchers make so you can write the story of you. Had I bothered to think about this carefully years ago I would have saved myself hours and hours of frustration. An academic resume is an asset and should be treated as a constantly evolving work in progress, not something you do under pressure to deadline. Most of the stuff I needed was on my laptop hard drive or the internet, but my computer is a bit like Thesiswhisperer Jnr’s bedroom. He’s nearly 14 now and it’s like the second level of hell in there – books, underwear and musical equipment strewn everywhere. I’m too scared to enter (come to think of it, that’s probably the point of all that mess). My digital stuff was strewn everywhere; stuffed in the wrong drawer, hiding under the bed or rotting, like a forgotten banana in a lunchbox. Not only was my own digital ‘room’ messy, I had extended this mess through the rest of the digital house. Bits of ‘me’ were stashed online everywhere – Google, drop box, academia.edu and various other sites. I fly around the world giving keynotes, presentations and workshops at other universities. This is a mark of peer esteem – if someone has bothered to pay for you to get there they must think you are good. I never took the time to write down the times and dates of these presentations in my CV – let alone the title of my talk. Retrieving all of this detail was a painstaking task in which my electronic diary was an invaluable tool. To find my keynotes I scanned it for flight numbers and place names. From this I pieced together a list of keynotes and workshops I had done elsewhere. This took a really, really long time because I didn’t realise when I started all this flying about that I would need the information later and it was a mess. Later you will have to prove you have performed ‘service’ to your communities. This is stuff like committees, consultations, peer reviews, grant evaluations, editing work, organising events etc. I have done a ton of stuff over the years, but I rarely, if ever, wrote it down. Use whatever system you like, but think of your diary as a way to record everything you do for other people, no matter how insignificant it seems at the time. If you want to be super organised, attach the script and/or power point to the diary entry and be consistent with how you label these entries so you can search them all at once. Making a list of service activities and compiling peer esteem evidence later will be a breeze. There are many ways to store your research papers online: Academia.edu, Linked in, researchgate … We are in a pre-Facebook era in academic social network terms. It’s far from clear which service is the Next Big Thing and which will be the next My Space and get Betamaxed. While we wait to see what happens, I recommend you decide on one and use that as a ‘warehouse’ from which you always keep up to date. Then populate the other sites when you have time. Start by making sure you index your final copies in your own reference manager, then transfer the details online somewhere. For now I’m choosing OrCID because libarians tell me that’s the best one and I trust them. 3. File everything by activity, then year. Where do I even start with filing? No system is perfect, but for some time I’ve been following guidelines set out by David Allen in his classic book ‘Getting things done’. Allen recommends filing by activity. I’ve found this to be marginally better than any other system. I’m still a PC girl at heart, even though I work on a Mac. I love a neat file structure with only a few, carefully chosen bits and pieces in the root directory. This isn’t perfect, but I usually remember when I wrote something, not necessarily what I called the file, so it’s good enough. I keep a copy of my current library of papers in the root directory so that I can send it to other researchers who ask for it – and as a back up just in case my library goes up in digital flames (I’ve never really recovered from a bad Epic Endnote Fail Incident). Look, whatever works for you, but a good file structure should keep searching to a minimum. If I can’t find a file by name at least I know where to tell the computer to look for it. It’s well known in marketing circles that customer testimonials have power. How better to tell someone how great you are than to use other people’s words? Hey, if they take the time send it to you in email, even better. Thank them nicely and file it in a folder called ‘thank yous’. Even if you don’t use their words, you’ll remember who your supporters are and can chase them up for a glowing testimonial when the time comes. One day you will have to demonstrate the ‘impact’ of your work. The most common way to do this is to look at citations your papers have attracted and the measure that’s often used is the ‘h-index’. The h-index has been criticised for being deeply flawed, but if a number is there, people will use it. My h-index is 4, which will sound low to those of you in the sciences. That’s because the h-index is built for disciplines like computer science, who publish short papers, not books and lengthly essays like we do in the humanities. To put my relatively low h-index in context I benchmarked myself against other scholars in my discipline and school. I was heartened to learn that, despite all the time I have ‘wasted’ on blogging, I was average for someone already at the level I was aspiring to get to at ANU. One influential professor, after 30 years of publishing, had a h-index of 9. While I was doing this benchmarking I noticed how few of my colleagues had a Google scholar page, which automagically generate your h-index for you. I just can’t understand why people would neglect this useful scholarly tool, which is essentially a brag wall. It’s easy enough to create one if you have published something and have a university address. Try to do it while you are still enrolled. That’s just some of my pointers, but I’d love to hear more tips and ideas in the comments. Everytime I talk about this mundane stuff I learn cool stuff from you. How do you organise your digital stuff so you can keep your resume up to date? This entry was posted in Getting things done, Your Career and tagged organisation. Bookmark the permalink. « From scholar to dollar! Good luck with your promotion Inger. My tip is: I have a folder on my computer, and one in my email in-box that says ‘D – E’ as that is going to be my next promotion. Each time I get one of those ‘thankyou’ emails, a journal acceptance, speaker invitation or any other bit of evidence I file a copy in the folder or the in-box. This system helped remind me about what I’d done, and reduced my search time a lot when I wrote my ‘C-D’ promotion application. brilliant idea Jenny! I’ll be sure to implement this idea. If I’m not successful this round I’ll need to keep gathering. Thanks once again, Inger, for a great post. I have some additional tools for trapping info that might be useful for readers. 1. Our department reports quarterly on our research outputs. Those reports can be a great source of personal information. 2. Since I did some adult education training, I have kept a teaching log reflecting on personal bouquets and brickbats. I keep all the nice/nasty things people say as evidence and write those up each quarter (scheduled e-diary reminder). 3. I also have kept, since 1992, all my PD in an excel s/s. I detail when, where & for how long I have done courses, reading, webinars, etc. That too makes compiling a list of achievements easier. Gosh, good ideas there too. Thanks – I like the idea of an excel spreadsheet. You could also use it to track citations once a year and show trends for impact perhaps? 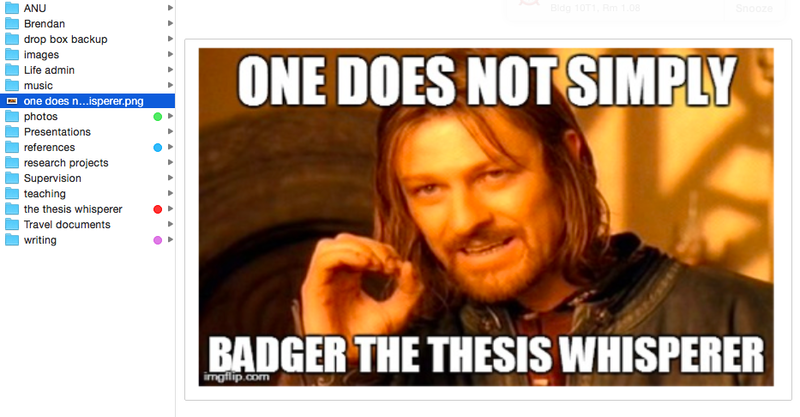 Thanks for another excellent post thesis whisperer! I’m fanatical about organisation (I often think about writing a blog post where I define it as my ultimate hobby) and definitely agree that centralising all your achievements is important. I’ve chosen to create my own webpage for this. It’s got a fancy and appropriate url (genevievesimpson.com) and from there I can link to my google solar, researchgate, academia.edu, linkedin, orchid, researcherid, Twitter, blog and university research profile. It’s a great place to put presentation titles and publication titles, and then I do a short post for everything else I do, like engagement activities, committees, masterclasses, courses etc. I like that it’s independent of an Ed social media site, which as you point out might become redundant, and it’s also institution non-specific, so I can take it with me wherever I go. A lot of my work involves engagement with the community, and a lot of people have liked that they can see what I’ve done and having my own url gives me some legitimacy. It’s easier to navigate for the public than a research-specific social media site, too. I’m not terribly computer literate and was surprised at how easy it was to set up my own site. It costs about ten dollars a year to support and friends with existing websites are a great source of info (see fionamcrobie.com). I’m very much a fanatic about organisation too Gen! I keep organised by continually updating my website (also fancy and appropriately named, bronwynmilkins.com) and with two working CV Word documents: One document is a good copy of my CV ready to submit to anyone who asks, and the other document titled, “Extra CV activities”, is where I jot down any courses, volunteering, etc. Essentially, “Extra CV activities” are those activities that don’t quite fit on the good copy of my CV but are ready to put on the CV depending on the job I’m applying for (and, I’d imagine, would fit well in a promotion package). I’m finding this process really helpful and hopefully I’m capturing everything I’m doing as a PhD! awesome and inspiring post – as usual! This correlates for anyone starting their professional career too! In Brazil if you want to get funding or apply for a master or a PhD degree or for an academic job you have to create a profile on “Plataforma Lattes”. This is provided by a government agency (called CNPq) and it is basically an online database for academic CVs. Very lengthy CVs… As you can imagine, every single researcher in the country has a profile there, which is quite useful some times. For example, I use it quite often to find other publications by an author who wrote a paper relevant to my research. I have also used it to identify the experience, knowledge and better understand the points of view of those who developed the teacher professional development course I currently study. It is also a useful resource when applying for a job as you can view the profile of those who work at the department you are applying for a position. It is very detailed and for this reason a proper pain to create, but I think it work quite well for the purpose described in this post. Specially considering you are forced to update it every once in a while. After all, we cannot do research without funding (note: the obligation of submitting with the proposal their Lattes CV applies to everyone involved in the research project, not only for the main researcher). I was tempted to ignore this post, being a digital native with well organised personal website, LinkedIn, Twitter, Academia.edu, Orcid, Google Drive, etc, but you’ve made me realise it’s time to sort my non-online files out, thank you. Enjoyed reading this – thanks for the advice. Re: ‘If someone is nice to you…’, just before I became a head (am in the UK), another head advised a group of us to ‘Keep a Positive File’ with copies of emails, thank you cards and heart-warming messages in one central place. She said that, on the toughest days, (and all heads/principals have them!) it would be reaffirming and reassuring to flick through the file and to remind ourselves of the positive feedback we, or our school, had received. I called mine my ‘Happy Book’, and I kept it going through the ten years of my headship. It ran to four Lever Arch files eventually! And, in the post-career phase of my life where I still do bits of consultancy work, I’ve kept it going. Yes, it’s useful if you need to reference your skills and strengths using third party endorsement. It’s also very helpful to give you a lift if ever you need it! Really great article Inger and I think it really highlights the importance of building up your portfolio of activity and evidence over time by adding info in as and when. I know I’ve certainly had the same problem in the past and have had to scoot around looking for evidence of my competencies, particularly in advance of interviews! If anyone is looking for a tool to help them organise their information, you might want to have a look at Vitae’s RDF Planner as an option? It’s an online tool that has been developed specifically to help people to build their portfolio over time, and also help to identify areas to develop (for example for that next promotion or job) and create a trackable action plan too (to help you keep motivated to keep going to get to where you want to be!). It allows you to store your evidence in one place and hence alleviating the pressure of trying to find your information from a variety of different sources (often to a tight deadline, such as when you want to apply for that sought after job that crops up and you have to respond quickly). Great post and advice, i have just started my PhD! So am taking note of those wise words, thank you!